Roasted Peanuts are the perfect complement to any salad and this recipe is just the dish for surviving those hot summer months: light, healthy, and easy to prepare. The season of outdoor parties and entertaining is upon us, and along with it, the need for new recipe ideas. And although the first thing that comes to mind with BBQ’s isn’t always a salad, it is as much a staple side-dish as any, and worth a coveted spot in your recipe box. Our Spinach & Strawberry Salad with Honey Roasted Virginia Peanuts is light, tasty and takes no more than 5 minutes to prepare; a busy host/hostess’ dream. And it doesn’t get any better than topping it off with sweet, in-season strawberries. 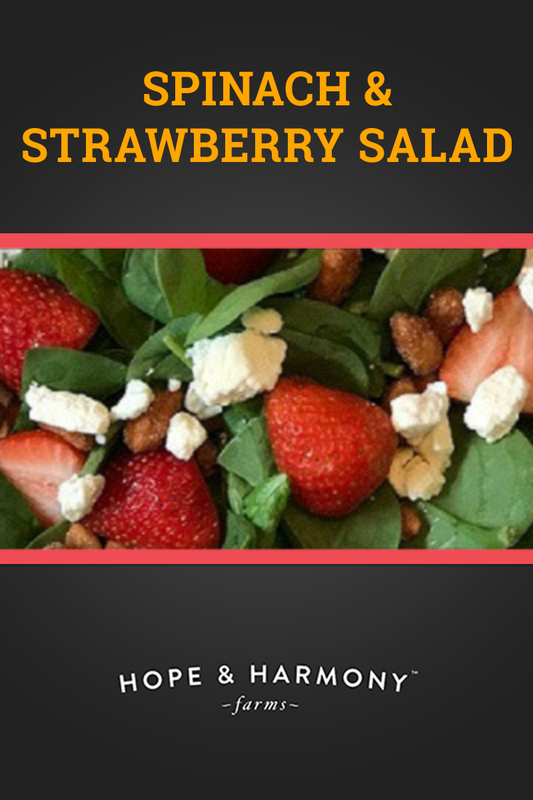 The combined tastes of sweet and savory paired with nutrient-dense spinach, Roasted Virginia Peanuts and juicy strawberries create the perfect dish for the warm summer months. Packed with fresh, whole foods, you’ve got nearly every taste and nutrient covered with these farm-to-table ingredients. Strawberries are rich in antioxidants, a great source of Vitamin C, Potassium, Folate, Dietary Fiber and Magnesium. While strawberries (like all berries) pack a nutrient-dense punch, they are scrumptious enough on their own that we don’t need too much convincing for us to dive right in. Local to Virginia? For fresh, locally sourced produce, stock up on in-season berries from our neighbors at AgriBerry in Richmond. We’d be hard-pressed to pack any more goodness into a leafy green; spinach is loaded with vitamins and minerals. Spinach is high in fiber, low in calories, provides support for bones and muscles, and has been known to positively impact cholesterol. As fourth-generation peanut farmers, we’ve been growing the highly-coveted Virginia peanuts for over a century. With over 30 essential nutrients, 8 grams of powerful plant protein per serving, and a healthy dose of resveratrol, Virginia peanuts are a nutritional powerhouse. Packed with protein and healthy fats, they’re the perfect food to keep you energized throughout the day.